Whether, in these latest supposedly critical days, there will be a deal or not. The question was posed by a source watching and waiting at the edges of these talks – outside that DUP/Sinn Fein negotiating circle within which the immediate future of devolution will be determined. Skirmish is a reference to what happened at the Conservative Party Conference in Manchester – that clash over identity; Michelle O’Neill’s view that “the North isn’t British” and Arlene Foster’s response that “of course Northern Ireland is British”. 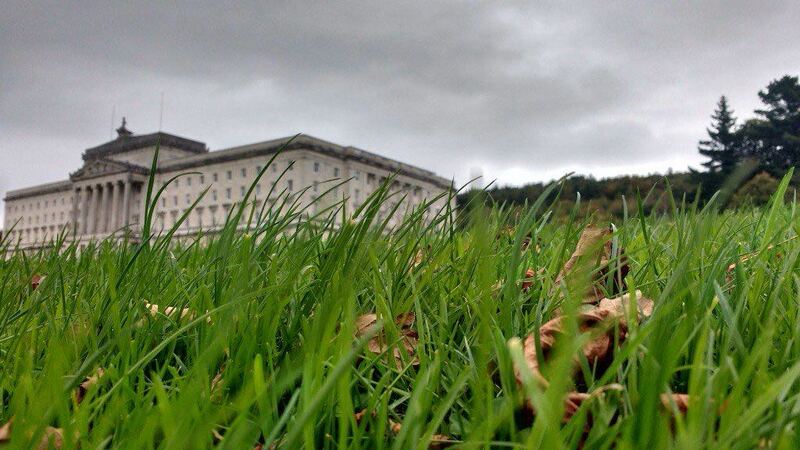 In the way political agreements here are usually carefully choreographed, would there have been such a public disagreement If things at Stormont were close to a deal; as close as some have been suggesting in references to mood and tone changes? On Saturday, a senior DUP politician pointed me towards MP Sammy Wilson’s comments in the News Letter under the headline – Time has come for SF to ‘get realistic’. “He has maintained that same constant,” that senior DUP source told this website in a reference to Wilson’s comments. “I’ve never, in the past 7-10 days – when there has been that quiet optimism – I’ve never got to the bottom of it,” the source continued. I asked could his party sell an Irish Language Act. “As a stand-alone Act, I don’t think you would even want to try,” was the response. Republicans have not been talking up progress. We hear references to “ongoing discussions”, that there are “key outstanding issues” and, as these talks drag out and drag on, there are concerns about the credibility of this process – about how much longer it can continue. “Running out of road,” is how one republican described things. Speaking in Manchester, Sinn Fein’s Northern leader Michelle O’Neill put down a marker: “The British Government should not think that they can cobble together a deal acceptable to the DUP and then shoe horn Sinn Fein into acquiescing to it. If the DUP and Sinn Fein were close to a deal, why the need for such public commentary; comments repeated at Stormont on Wednesday. There is concern that the NIO could “land in with a paper” – one of those ‘take or leave it’ moments that occur within negotiations. The talking from around these talks is that the “Arlene issue” is sorted – the question about whether the DUP leader can be First Minister before the completion of the RHI Inquiry. As far back as June, this website reported that “depending on the deal” – in other words delivery on those rights issues covering an Irish Language Act, marriage equality, legacy including inquests and other matters – then this issue could be resolved. So, it is not as simple as the “Arlene issue” being sorted. It can only be sorted in the context of a wider agreement on the above. We wait now for the outcome of the talking over these next critical days. The final skirmish before a deal – or the end of the road? That question should be answered soon. October 8, 2017 in News & Current Affairs. If I have understood correctly, one of the DUP’s sticking points over the Irish language Act is the potential cost involved of the use of Irish in official documents and Court cases being held in Irish if demanded. SF require more Irish speaking civil servants in Government Departments to enact these requirements. Perhaps the DUP’s fears could be alleviated if they were to find out how many Court cases are actually conducted entirely in Irish in the ROI. Secondly, as an interpreter myself, but not for Irish, I would ask SF to consider why more Irish speaking staff would need to be recruited when it would be infinitely more professional to employ properly qualified interpreters. Only saying! When two languages exist “the state” has a duty to provide equal opportunity for both languages. The St Andrews Agreement, signed in 2006, involved the two major parties in the North – the Democratic Unionist Party (DUP), led by Dr Ian Paisley and Sinn Féin, led by Martin McGuinness in the North – agreeing to terms that would introduce a power-sharing executive (or government) to the province, which had been under direct rule since 2002. In this context, ‘the government’ means the British government, which means that the pledge made isn’t by the DUP, but by the British government at the time. But what the British government actually legislated for after St Andrews Agreement differs from what was agreed to at St Andrews. The UK government legislated for a language strategy, which would ensure the “enhancement and protection of Irish and Ulster Scots language” – with no mention of an Irish Language Act. Although a language strategy could include an Irish Language Act, it doesn’t have to, as provisions for protecting a minority language could mean increasing funding for Gaelscoileanna, or hiring Irish language officials, and so on. So although the DUP signed the St Andrews Agreement, they never agreed themselves to implementing an Irish Language Act as part of the deal. 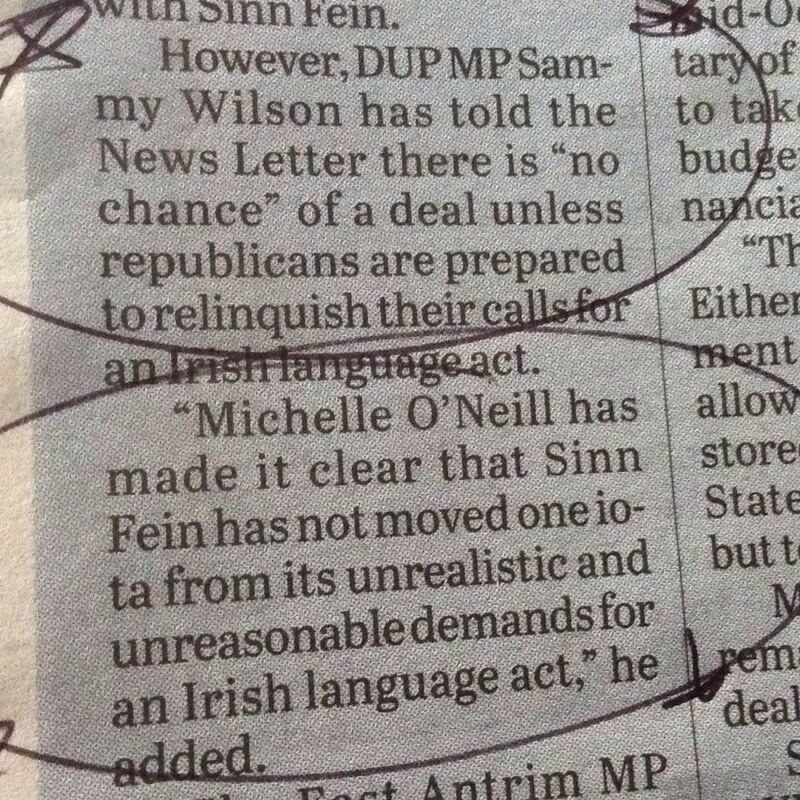 So is there a commitment by the DUP to an Irish Language Act anywhere else? We contacted the UK House of Commons Library for them to expand on a research paper about the St Andrews Agreement, and they offered some insight into how agreement was reached. They said that during negotiations at St Andrews Agreement, the Northern Ireland parties were supposed to confirm their acceptance of the Agreement by 10 November 2006. The DUP issued a four-page consultation to its members on 18 October 2006 called “Your verdict – what is it to be?” which included contents of the Agreement and also what it saw as still under negotiation – including their stance on the Irish language. The DUP issued a statement on 9 November 2006, detailing a resolution of its Party Officers, Assembly Group, and Party Executive. This did not mention the language issue. We have not been able to find any mention of a commitment by the DUP in Assembly debates (there may have been claims about it, but there was no actual commitment by the DUP), in Westminster debates, or in media reports at the time of St Andrews or ever since. We also asked Sinn Féin if any of their members had received an assurance from a DUP member that an Irish Language Act would be established, but Sinn Féin did not respond to that request. Another strong statement on the Irish language came in an Irish Times article from August 2007 by DUP leader Dr Ian Paisley, entitled ‘Paisley to block Irish Language Act’. “The DUP will not support the creation of any such legislation. This was a proposal made by the two Governments (British and Irish at the St Andrews talks) and was never agreed to or even discussed with us. A more recent example of DUP member Gregory Campbell in 2014 is even stronger: “The DUP politician who mocked the Irish language earlier this month has said he would treat a proposed Irish Language Act ‘as no more than toilet paper’”. The DUP’s claim that they never agreed to establish an Irish Language Act as part of St Andrews Agreement is true, as the legislation refers to the British government’s commitment to an Irish Language Act, not the DUP’s. Although they signed up to the St Andrews Agreement, this includes a commitment by the UK government, and not the DUP. After devolution, responsibility for a language policy was transferred to the Northern Ireland Executive, but this did not include a commitment to establish an Irish Language Act. What was legislated for was a language strategy, which could include, but is not the same as, an Irish Language Act. Apart from the St Andrews Agreement, there’s no evidence that they’ve ever agreed to establish an Irish Language Act. They may have not agreed to support an ILA but at the same time they didnt say they would block it using the POC. The British agreed and the assembly was the route to make it happen and the DUP agrred to this under St Andrews so why not abstain and hold noses if they wish. They pulled a fast one and are now paying the price for their dishonesty.